Few cities are as stimulating as London in the spring, my favourite time of year. Inspiration awaits the metropolitan wanderer around every corner. Ice thaws out, drizzle somewhat ceases, and the sun begins to shine. As the pavement trees gain back their leaves and flowers begin to bloom, London truly comes alive. London is one of the world’s grandest multicultural melting pots, filled with faces from every country, home to some of the most recognisable attractions around the world, and the birthplace of many a famous icon, from the royal Queen Liz to the fictional Sherlock Holmes. There’s much to do and see in London, especially during April and May, where events like the London Marathon, the Boat Race, and RHS Chelsea Flower Show drum up much excitement, as do the London Coffee and World Street Food Festivals. St George’s Day also has Londoners spilling merrily out of bars into the early hours of the morning. A trip to London wouldn’t be the same without heading to famed postcard attractions like Big Ben, Trafalgar Square, Buckingham Palace, and the London Eye, or paying respects to museums and West end shows. But tourists often get so caught up in the city's grander monuments that they forget to sample London's essence day-to-day. Between bouts of sightseeing, it would do you a world of good to take the time to relax like a local, enjoying the city in a time of freshness and renewal. So, without further ado, here's a lovely little guide I've put together for enjoying London, in the spring, like a local. Springtime is synonymous with lazy, idyllic Sunday mornings. London is still asleep, fuzzy and hung-over from its antics during the night before. I love going to markets for Sunday brunch. 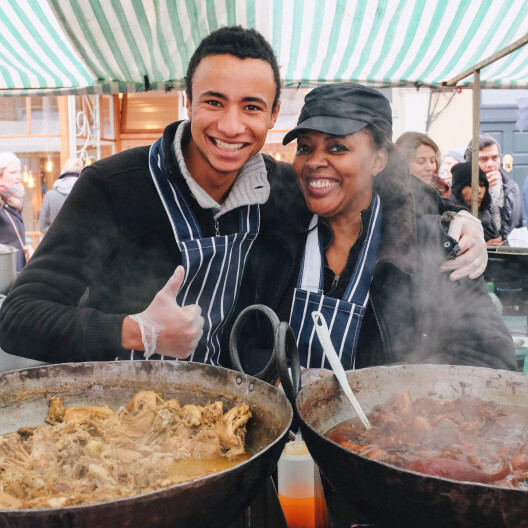 One wonderful food market to visit on a crisp spring morning is Broadway Market, which offers everything from lovingly crafted artisanal hot chocolates (with enormous marshmallows, very more-ish), to quality truffle oils, to slow-cooked pulled pork sandwiches. However, having grown up in West London, I’m partial to the buzzing vibrancy of Portobello Market, where you can relish freshly whipped up nutella crêpes, red velvet cupcakes from The Hummingbird Bakery, or a freshly fried falafel wrap. Browse the gorgeous antiques and vintage clothing, make friends with the local fruit sellers, and be entertained by the street performers. I also recommend strolling under the nearby Westway to view some incredible local street artwork, and to enjoy stunning views of the West London canal. For a proper British weekend, round off your evening with a staple Sunday roast complete with all the trimmings. A typical roast includes well-cooked roast meat (beef or chicken are most popular) with roast potatoes and vegetables, Yorkshire pudding (my favourite), and plenty of gravy. Great roasts can be found at most gastro pubs and restaurants. I’d recommend sharing a jug of Pimms as an appetiser as the afternoon fades into the evening, and having a cheeky glass of cider to accompany your meal. If you’re going to have a roast, you should definitely treat yourself to other classic British cuisines. Perfect for a sunny spring afternoon is the elegant British tradition of afternoon tea. Afternoon tea involves sipping earl grey from fine bone china cups; nibbling mini cucumber-cream cheese sandwiches; and enjoying buttery scones filled with clotted cream and jam. Swankier locations include The Georgian Restaurant at Harrods, Fortnum and Mason, and The Ritz London – all with excellent ambiance, good posh nosh, and occasional celebrities. Cheaper (but just as delicious) options include Le Pain Quotidien, Patisserie Valerie, or Yumchaa. Of course, if you’re on a budget, nothing beats a DIY teatime at home or in your hotel room. Pick up some scones, butter, and jam from your local, put the kettle on, and enjoy. You absolutely cannot leave the country without trying fish and chips. At the very least, have a battered sausage. Nothing beats an old school newspaper-wrapped portion of cod and chips from your local chippie (Micky’s Fish Bar is legendary); whack on plenty of salt and vinegar and eat outside in the crisp weather to truly savour the heavy, tangy flavours. For a modern twist, dine in The Fish Club for veggie options and ethically captured fish, or sit down at The Golden Hind, voted as the Critic’s Choice for fish and chips by Time Out. A good old English fry up breakfast also never goes amiss if you need some substance in your stomach, especially after a heavy night out in town. A typical fry up includes bangers (sausages), bacon, eggs, baked beans, hash browns, mushrooms, toast, and tea. Head to the nearest greasy spoon – a colloquialism for a diner or café – to get a decent fry up. If you’d prefer a more refined ambiance, try out Aubaine or The Breakfast Club. The latter restaurant is always chock-a-block, so be prepared to queue. Springtime weather is splendid for an afternoon tipple. Ales, brews, cocktails, mocktails, and fine wines abound. Countless pubs and bars await the metropolitan wanderer. If there’s one thing Londoners can agree on, it’s the appreciation of a good drink. The Austrian Tiroler Hut on Westbourne Grove is always a good laugh. Order a double Weiss bier, a bottle of apple schnapps, and prepare to be hung-over! Bar Story, a hipster pizza bar located in a tunnel beneath Peckham station, has great cocktails, lagers, and local brews. To gratify your inner cocktail critic, head to Shrub and Shutter, Three Eight Four, or Peg and Patriot for incredibly well made cocktails. Even if, like myself, you don’t drink alcohol that much, the artisanal mixing of each spirit will have you nodding appreciatively. There’s nothing like sipping a refreshing drink as the sun goes down over London’s skyline. For fantastic views of the city, head to rooftop Madison Rooftop Terrace, which has amazing views of St. Paul’s Cathedral. Relax with a beer or soda as day fades into dusk. London nightlife caters to all, and in the spring, there are many great live music nights and clubbing events cropping up. The spectrum of nightlife ranges from cheap and cheerful to high end and expensive. Great places to bar hop include Shoreditch, Brixton, Mayfair, Soho, and Camden. If you do go clubbing, try and get yourself on the guest list in advance – it can save money and time queuing. Make sure you stick to dress codes, and always, always bring a valid ID – especially if you’re lucky enough to be baby-faced! There’s still a touch of frost in the air – our noses and ears are pink, and our gloves and scarves remain firmly donned – but that’s the beauty of London in the spring. I like to rise early and head to the park, gloved hands wrapped around a steaming take-away cup of coffee or tea, breathing in the fresh morning dew. Take a stroll through your nearest park; sip your warm beverage on a bench and smile at passing strangers, even if their faces are sullen and detached (as Londoners so often appear to be). For a moment, they’ll be taken aback – but they’ll always return the smile. Wander through Hyde Park if you can, to the Princess Diana Memorial Gardens, and towards Kensington Gardens, also a beautiful area. Saunter past the Serpentine Gallery and catch some early morning swimmers plunging into the freezing water pools and racing each other. There are cycling lanes all over Hyde Park; hop on a Santander bike (an affectionate term for the public bicycles that can be rented around the city centre) and cycle around the park, which intersects with some main roads and roundabouts. Most of the main parks have large, pretty lakes. If you’re more of a water baby, you can rent out a boat and go for a scenic float. Other wonderful places to breathe in fresh air whilst admiring the city include Hampstead Heath, Primrose Hill, Greenwich Park, and Telegraph Hill. Hampstead Heath, apart from being nestled in a beautiful area filled with cafes, bars, and independent boutiques, is the perfect park for a picnic. The highest point on the hill offers incredible views of the city skyline – a fantastic place to catch the sunrise or sunset. Primrose Hill offers the same gorgeous views, and is generally quieter than popular Hampstead Heath. Gorgeous photo opportunities abound in London, especially during spring. When the air is crisp and the sun is bright, the city is illuminated. You can get beautiful panoramas of the River Thames and the London skyline from the Embankment. Check out the view of the Thames from the Chelsea area; the views are just as beautiful, but much quieter, and much less crowded. There are usually only a handful of people strolling along the bridge. Once you’ve finished taking in the bliss of the River Thames in the spring, go forth and venture into that wonderful hub of commerce, Sloane Square, where the cast of Made In Chelsea swan about getting blow-dries and "randomly" bumping into one another on the street. Greenwich is another beautiful place to visit. There’s a market, offering everything from noodles to bespoke mineral jewellery. There are shops, boutiques, and cafes. There’s the Greenwich Maritime Museum, which features some incredible architecture. The whole place is just stunning. You can catch the sunset from Greenwich Park, or just by standing at the river’s edge. Whenever I come to Greenwich, I feel like I’ve travelled back in time. It feels as though we have the same view as they did in an older London, like the Victorian era, because the docklands have remained much the same. For all the places and ideas around the city that I could recommend, we see through different eyes. London is subjective for each and every person. Your experience here will be informed by where you go, the things you do, and the people you meet. Once you’ve seen the sights, had your photo opportunities at the tourist attractions, and cherry-picked places to visit around the city, give yourself time to wander freely, to make your own discoveries. I adore London, especially in the spring. Thanks for reading and sharing! If you have questions, let me know. Check out Time Out London for some cool things to do in the city this month. Article originally published in The Filipino Expat.